Glenwood Springs fire firefighters work to extinguish a car fire that broke out late morning on I-70 near the Yampah Vapor Caves. A pickup truck caught fire Thursday morning around 10:30 a.m. on Interstate 70 at mile marker 116, fully engulfing the vehicle and setting off a brief wildfire, according to Glenwood Springs Fire Chief Gary Tillotson. When firefighters arrived on scene, the vehicle was fully engulfed in flames, while embers spread to vegetation on the other side of the Glenwood Canyon bike path, causing a small wildfire to break out. Firefighters were able to extinguish the wildfire quickly, before getting the car fire under control. Witnesses reported seeing red gas cans on top of the truck, but the Glenwood Springs Fire Department said the cans were empty and didn’t provide fuel to the fire Thursday morning. A mechanical failure was the reported cause of the fire, which sent a towering plume of smoke into the air Thursday morning, concerning Glenwood residents for a brief period. 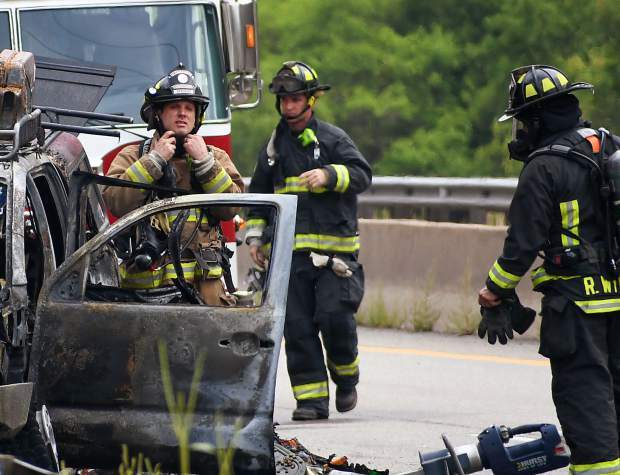 “It appears that a mechanical malfunction within the gas tank allowed the gas to pour out of the vehicle onto the road below, igniting the fire,” Tillotson said. Both lanes on I-70 westbound were closed for up to an hour to allow for proper cleanup, with the interstate reopening around noon. While responding officers requested for an ambulance at the scene, no injuries occurred, but one of the vehicle’s occupants was treated for heat exhaustion. This is the second fire in a week along I-70 westbound near Glenwood Springs that has caused the busy Interstate to be shut down for a period of time. The 113 Fire on Aug. 8 at mile marker 112 in South Canyon caused I-70 to be backed up well into the night. That fire was deemed controlled Tuesday evening.